I promise I won’t post on this every day — but I’m going to come back to this pretty often until we get through the votes on the Iran deal. Anyway — yesterday I asked everyone to call their Congressional representatives — Senators and Congresspeople alike — to thank them if they’ve already declared for the deal, to urge them to do so if they’re still (publicly) thinking about it, and, respectfully but very firmly, to give them grief if they’ve come down on the wrong side. I’m asking again. Here are the House and Senate directories. Today I’ve got a couple of new developments you can talk about when you do call. Samore quit his job as head of United Against Nuclear Iran — a pressure group that worked to deepen sanctions against Iraq and that now, under its new head, old friend Joe Lieberman (D then I, but really R-Likud) opposes the Iran deal. This is what “best available option” means: not that Lieberman and his herd of neo-con ilk can fart pixie dust and will away Iran’s political establishment, its institutional memory, and the broadly available knowledge of nuclear weapons design, but that we put ourselves in the most advantageous position we can to shape events as they unfold. Among some of Iran’s senior ayatollahs and prominent officials, he wrote, there is also dissent from the official line against Israel. “I was repeatedly struck by the willingness of Iranians to offer sharp, even withering criticisms of their government on the record, sometimes even to be videotaped doing so,” Mr. Cohler-Esses wrote. There you have it, folks: the deal on the table — even if the Iranians break it — still works to the advantage of the US, according to one of the most expert and skeptical figures in this long-running debate. And the Iranians have a polity that is not in fact a unified autocracy bent on rogue violence, but is instead a much more complicated web of interests, beliefs and aspirations — exactly the kind of situation that offers opportunity for those deft enough to seek it out. We all hear the report every week on the top issues being called/written about and the breakdown. That message isn’t lost. Your five minutes makes a difference. Go to it. Call your representatives. Let them know you’re paying attention. Once more: the House and Senate directories. *Snark, friends, if you’re not familiar with this pillar of New York Jewish newspapering. 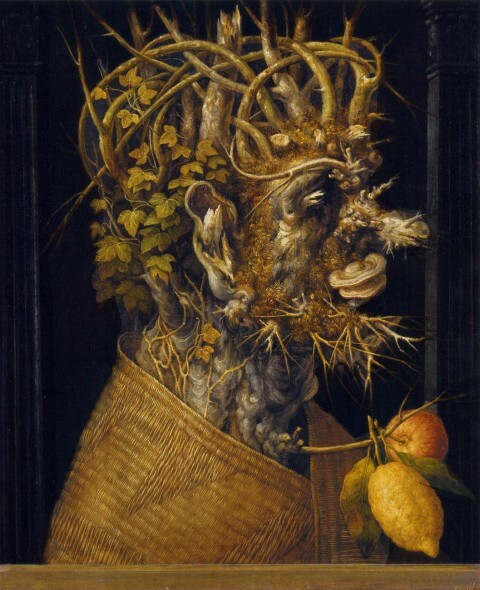 Image: Giuseppe Arcimboldo, Winter, second half of the sixteenth century. This entry was posted on August 12, 2015 at 4:11 pm and is filed under Middle East, rare sincerity, Republican follies, Republican knavery, The Good Fight, Unsolicited Advice, War, words mattter. You can subscribe via RSS 2.0 feed to this post's comments.